Vehicle Research & Development Establishment (VRDE) has released a tender seeking a development partner for upgrade of BMP-2 Sarath ICV's 30mm Gun turret stabilizer system and development of an interfaced Gunner & Commander sighting system. The vendor would be required to prove the complete system on the Sarath ICV by demonstrating target acquisition, aiming & firing on the halt and on the move at a static or moving ground & aerial target with an accuracy of 1mil or better. Develop twin axis stabilized Commander’s Panoramic sight. Engineer Modification on the turret to suitably replace existing Gunner sight and Commander Aerial sight with developed Gunner Sight and Commander sighting system & associated sensors in the same envelope of existing sighting system. Develop & Fabricate necessary adapters for mounting of sights and sensors. Interface sighting system with Stabilizer. Engineer modifications to stabilizer to interface with sighting systems. Adopt of existing Control Handles & other MMIs for operation of complete FCS. Develop FCS, software modifications; incorporate range tables and switch configurations in existing gunner & commander control handles to enable firing of various ammunition from the main gun & co axial weapon from Gunner and Commander sight. Evolve various modes of operation such as commander master, gunner master, target designation, Sight master, Gun Stabilizer master. Supply Gunner & Commander Stations. In addition, the vendor would be responsible for testing and trials of the systems. The existing Stabilizer specifications and functionality need to be retained. The modifications need to be carried out in stabilizer system for interfacing & integration with Commander’s Panoramic sight and gunner sight retaining existing modes of operation. The vendor shall have complete know how of existing stabilizer system. No armor cutting on turret will be carried out for fitment of sighting system and associated Electronics. Indian Army released a Request for Information (RfI) on October 21, 2014 from vendors willing to undertake Comprehensive Upgrade of BMP-2/2K covering Mobility, Fire Power and Survivability. The upgrade will be applied to approximately 2,600 vehicles comprising existing inventory as well as APCs to be produced in the future. Foreign vendors are free to compete directly for the procurement. Firms bidding for the upgrade contract would be required to upgrade one BMP-2/2K for trials on “No Cost No Commitment” basis. Russia exhibited its proposed upgrade of the BMP-2 ICV at DefExpo 2014. The kit based Russian upgrade can be implemented at low cost and in short time. The upgrade requires minimal modifications of the tower. Additional weapon fit can be implemented in place on a BMP-2. 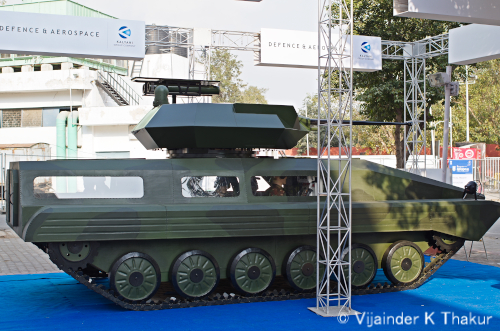 Pune based Kalyani Group pitched an upgraded BMP-2 Infantry Combat Vehicle (ICV) at the DefExpo 2014.. The upgraded BMP-2 features Rafael's Samson MkII remotely controlled weapon system with a 30mm cannon from ATK and two Spike LR missiles from Rafael. The turret, which features two MiniPOP optronic sights for the gunner and commander, is designed to fit armor protection according to the level specified by the customer.